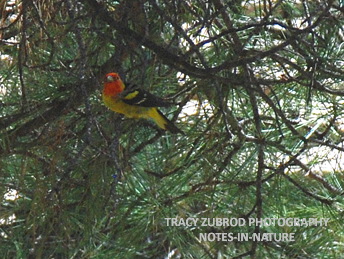 A western tanager is a bright colored songbird seen mostly in the summer. 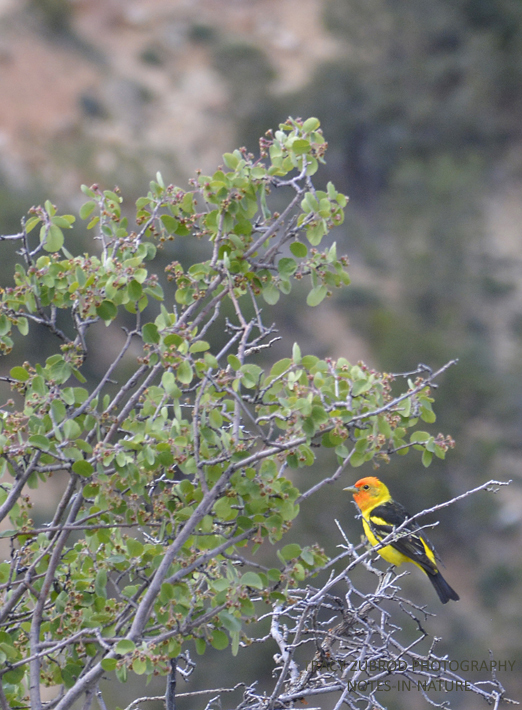 The male has a bright orange-reddish head, a yellow body and black wing feathers, back, and tail. The females and immatures are a paler version of the male. This tanager has distinct white wing bars. They live in open wooded areas across the U.S., although mostly in the west. I’ve seen them among ponderosa pines, douglas firs, aspens, gambel oak, and in pinyon-juniper forests. They migrate south into Mexico for winter. The tanagers obtain the red color on their head from a pigment called rhodoxanthin. They cannot make this pigment on their own, they get it from their diet, which consists mostly of insects, along with some fruit. Western Tanagers at one time were thought to be menace to fruit crops and were killed by farmers, threatening their existence. Today, they are protected under the Migratory Bird Treaty Act, their numbers have increased gradually over the last 50 years. This act protects migratory birds, making it unlawful to pursue, hunt, take, capture, kill or sell birds, live or dead. The act also grants full protection to any bird parts including feathers, eggs and nests. Bird migration is one of the most fascinating aspects of bird watching – if you write a lot about birds as I do you see that sources vary on the subject. I have learned to trust my journal for dates of arrival/departure for say the hummingbirds in the northeast who usually arrive in Maine between the 6th and the 10th of May. This year my neighbors in Maine didn’t see one until last night. Here in New Mexico I don’t know what to expect and most people don’t seem to know when birds come and go – so I am on my own. This week it had been Bullock orioles – wow what color – but they stayed only a day or two – sadly. Some bird books stay they are here for the breeding season – but not here evidently! Bird migration is a great treat to see different birds in my area, especially when I see in consecutive years. I have just started seeing these glorious tanagers and had no idea that their coloring had to do with diet – a fascinating note!